"Independent Business Alliances, community groups, partnering national organizations, and individual locally-owned businesses nationwide are urging citizens of their communities to “unchain” themselves on Saturday November 18—to do all their business on that day only at locally-owned independent establishments. The efforts are part of America Unchained, a national campaign of the American Independent Business Alliance (AMIBA). “Studies from small towns in Maine to urban areas like Austin, TX and Chicago’s Andersonville neighborhood found locally-owned independent businesses to generate 3 - 3 ½ times the overall economic benefit to our communities as chains. Why? Home town businesses use far more of the goods and services provided by other local businesses, which chains centralize at corporate headquarters. And despite corporate chain boasts about charitable giving, independent businesses give back more to communities from every dollar.... According to the US Small Business Administration, small businesses create two-thirds of new jobs, and the interdependence of home town businesses creates local job security." To be honest, my bookstore hasn't officially signed up to be involved. And I haven't heard much about this project in the national media. AMIBA is an organization still in its infancy. But it's growing fast. And I think it's one of the best resources for those of us who believe that independent, locally-owned businesses are important for so many reasons. You know what the reasons are, and they're not just economic: they have to do with using sustainable practices (less polluting transportation and outscale building projects), with spreading more personal connections and less anonymity and homogenization, with supporting people who are actually doing art and other projects in your home town, with making a place for uniqueness and originality, with creating real community. So maybe America Unchained! won't be huge this year. 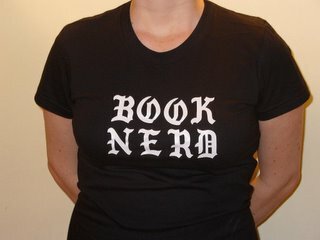 But my Book Nerd Challenge to you is to make it happen in your own Saturday shopping. Go to the local coffee shop, the local bookstore, even the locally owned clothing store. See how hard it is to avoid chains for just one day. And if you can, let me know in the comments what your day was like. What local enterprises did you discover for the first time? What neighbors did you run into? What weird, unique little encounters or products or inconveniences or joys did you experience? I'd even love to have someone write a guest post about it (email me if you're interested). I'll report back too. It'll be good practice for next year.